For those who own a recreational vehicle (RV), whether you use it as a second home or for taking regular road trips, there are pluses and minuses to doing so. Like anything in life you have to weigh the positives of the item you want against the negatives that may exist. When it comes to owning an RV, you probably see advertisements everywhere of happy people crossing the country in their RVs; they’re barbecuing burgers, hiking in the woods, and visiting all the greatest landmarks. The idea is that life is more adventurous and simply better when you own a RV, and for some people it is exactly that. But even if the RV life is the dream life for you, there are still some drawbacks to owning one. In today’s blog, we’re going to go through some of the positives as well as some of the negatives to RV ownership for your consideration, and for those of you who already own an RV, we might just have some of the perfect solutions to managing those negatives. 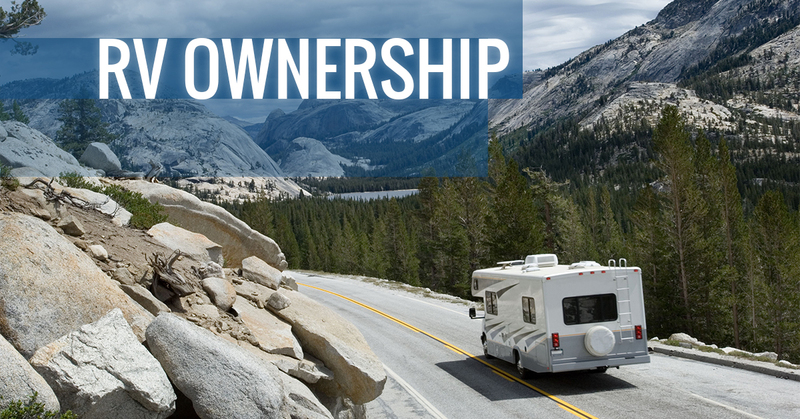 One of the greatest benefits to RV ownership is the ability to take your home with you anywhere. Whether you attach it to your truck, or it has a cabin to drive from, you can easily drive your RV to any hookup site and still have a comfortable and familiar bed with you to sleep in each night. Additionally, you’ll always have a kitchen and bathroom available in the privacy of your roving home, no matter where you go. Many retirees love the benefits that RVs can bring. They make it easy to travel many places at an affordable price. You will never have to go out to restaurants for meals or find a hotel room so you can sleep. If you’re looking to visit many places all over the continental United States, and even beyond, owning an RV may be the perfect way to do so. Now we need to talk about some of the drawbacks. The most difficult part of owning an RV can be the cost of gas. Fueling up can really hurt your pocketbook as many RVs require substantially more gallons of gas than your typical car, and they also don’t go very far on the same amount. Large RVs can sometimes only get a handful of miles to the gallon depending on the type that you own. There are a few ways around this predicament so that you can reduce the cost of gas while you own an RV. One option is to choose a smaller RV, or one that is towed by a truck. The other option is to utilize RV shipping services from Secure Auto Shipping when you need to bypass several states for your travels. Letting Secure Auto Shipping help you bypass many miles will allow you to reduce your gas cost, save you time, and cut back the number of unnecessary miles you put on your RV. When you love the idea of RV ownership, or perhaps you already own one, then let Secure Auto Shipping help you cut down on gas costs and extra milage when you need to move your RV. Contact us today for more information on RV shipping and for a free shipping quote.